Warham Camp is a large and very well-preserved Iron Age fort sitting within agricultural land, and is a scheduled monument. It is arguably the best earthwork of this period in the region. 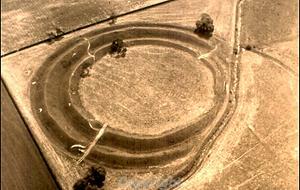 It has been repeatedly surveyed by aerial photography, and is a circular structure with an overall diameter of 212m. The course of a channel of the River Stiffkey cuts across the south western edge of the earthworks, but this is an 18th century alteration and the original river ran in a curve to the west. There are outer and inner ditches and banks, and excavation in 1914 and 1959 produced evidence for a timber palisade and platform at the rear and timber revetment on the inner face. Iron Age and Roman pottery sherds have been recovered, including a greyware sherd, as stray finds between 2009 and 2014. Hillfort with evidence for occupation of the enclosure during the Iron Age and into the Roman period, up to the 2nd century AD. 1914. Excavations produced Roman and Iron Age occupation. 1959. Further excavations: evidence of Roman building. 1983. Iron Age and Roman sherds found. See full details, schedule, plans and cuttings in file. E. Rose (NLA), 9 November 1990. 21 January 2001. Found in molehills by K. Hinds and  near centre. K. Hinds (NLA), 30 January 2001. Four Roman sherds found in mole hills in centre of site. A. Rogerson (NLA), 19 December 2001. The earthworks of Warham Camp Iron Age hillfort are clearly visible on RAF aerial photographs from 1946 (S1), CUCAP aerial photographs from 1951 (S2) and 1957 (S3), AAF images from 1977-8 (S4-5), NLA aerial photographs from 1984, 1990 & 1993 (S6-8) and BKS photography from 1988 (S9). Warham camp is located at a height of 15m OD and is circular. It is centred at ca. NGR TF9436 4087. The external diameter of the site is about 215m, while the internal diameter is about 120m. Excavational evidence indicates both Iron Age and Roman occupation and activity. Like many earthwork sites, Warham Camp suffered due to changing landscape aesthetics in the middle of the 18th century, when the south-western side/curve of the monument was levelled to improve the view from the nearby Warham Grove House and to straighten the course of the river Stiffkey. Within the hillfort there appears to be the remains of ridge and furrow of uncertain date. Although the origin of the ridge and furrow is unknown it would seem likely that it is relatively late. On some of the aerial photographs, slight inner rings may possibly be visible within the hillfort. H. Clare (NMP), 11 October 2002. A slight increase in rabbit disturbance, this especially on outer face of inner bank to south. Fresh erosion with fall of chalk moved to both sides of western entrance. Some eroded areas showing grass regeneration. Mole activity very pronounced to west on inner face of outer bank and outer face of inner bank. Information board loose and covered in green mould. to visit to monitor rabbit and mole activity (site is SSSI). Moles are seasonal and upcast will grass over. H. Paterson (A&E), 4 March 2003. 2001. Found in molehill within enclosure. .
Roman basal sherd with foot-ring (surviving only a scar) coarse sandy with sparse grits and iron ore, dark grey reduced with brown exterior surface (weighing 10g). A. Rogerson (NLA), 19 November 2003. November 2004. Casual find. In molehill between banks of defences at TF 94365 040969. 1 base sherd Roman greyware with sparse large quartz inclusions (weighing 31g). A. Rogerson (NLA), 18 February 2005. June 2007. Found in molehill within enclosure. J. Allen (NLA), 4 June 2007. February 2007. Casual surface find. A. Rogerson (NLA), 16 February 2007. March-April 2007. Casual surface find. A. Rogerson (NLA), 21 May 2007. Iron Age and Romano-British sherds. A. Rogerson (NLA), 7 March 2008. Two year Section 17 agreement signed. Before March 2009. Chance finds. Iron Age and Roman pottery found in mole hills. See list in file for details. E. Darch (HES), 13 February 2012. Before 29 October 2010. Surface find. Romano-British pot sherd pot sherd. A. Rogerson (HES), 16 March 2011. D. Robertson (NLA), 25 March 2011. May 2011. Stray find. . The site is in good condition, good grass cover and no real scrub. There is poaching along the ramparts and trackways created by both livestock and walker. There are mole hills on the interior. K. Powell (HES), 23 December 2013. October 2013. Stray find. .
January 2014. Stray find. .
--- Aerial Photograph: TF9440 A-AN,AS-ABA,ABQ-ABT; TF9441 AL-AQ,AT-ABA. --- Aerial Photograph: Edwards, D.A. (NLA). 1997. TF 9440ACH - ACK. --- Aerial Photograph: Edwards, D.A. (NLA). 1998. TF 9440ABY - ACG. --- Monograph: Lowerison, B. 1909. The Sites of Three Danish Camps and an Anglian Burying Ground in East Anglia. The Saga Book of the Viking Club. Vol VI, pp 1-8. --- Article in Monograph: Gregory, T. 1986. Warham Camp. Excavations at Thornham, Warham, Wighton and Caistor St. Edmund, Norfolk. Vol 30. EAA No 30 pp 22-26. --- Article in Monograph: Rickett, R. 1992. The Other Forts of Norfolk. The Iron Age Forts of Norfolk. East Anglian Archaeology. Davies, J. et al. No 54 pp 59-68. pp 59-61. --- Article in Serial: Lawson, A. 1980. Warham St Mary Fort. Archaeological Journal. Vol 137 p 330. --- Archive: Clarke, R. R. and NCM Staff. 1933-1973. Norwich Castle Museum Record Card - Neolithic. Warham (st mary). --- Archive: Clarke, R. R. and NCM Staff. 1933-1973. Norwich Castle Museum Record Card - Iron Age. Warham (st mary ). --- Archive: Clarke, R. R. and NCM Staff. 1933-1973. Norwich Castle Museum Record Card - Roman. Warham . --- Archive: Clarke, R. R. and NCM Staff. 1933-1973. Norwich Castle Museum Record Card - Medieval. Warham. --- Article in Serial: 1960. Norfolk Research Committee Excavations 1959. Norfolk Research Committee Bulletin. Series 1 No 12 (for 1959) p 1. <S1> Aerial Photograph: RAF. 1946. RAF 106G/UK/1571 4254 07-JUN-1946 (Norfolk SMR TF 9341C). <S2> Oblique Aerial Photograph: CUCAP. 1951. NHER TF 9440ACT (CUCAP FQ0044) 15-JUN-1951. <S3> Oblique Aerial Photograph: CUCAP. 1957. NHER TF 9440ACL-M (CUCAP SO73, 75) 28-MAY-1957. <S4> Aerial Photograph: 1977. SMR TF 9440AG-AH (AFF 110/19, 21) 15-APR-1977 (SMR). <S5> Aerial Photograph: 1978. SMR TF 9440AJ, AL (AAF 161/7, 9) 12-JAN-1978 (SMR). <S6> Aerial Photograph: 1984. SMR TF 9440AR (NLA fl.142 / AUZ8) 04-APR-1984 (SMR). <S7> Aerial Photograph: 1990. SMR TF 9440ABT (NLA / GBW11) 29JUN90 (SMR);. <S8> Aerial Photograph: 1993. SMR TF 9440AX (NLA / FZH5) 25-FEB-1993 (SMR). <S9> Vertical Aerial Photograph: BKS. 1988. BKS 8402 27-MAY-1988 (NCC 0951). <S10> Unpublished Document: Norfolk County Council. 2008-2009. Section 17 Management Agreement. <S11> Unpublished Document: Norfolk County Council. 2010-2011. Norfolk Monuments Management Project Section 17 agreement.